On Saturday, February 11, 2017, the Southside Civic Club held the annual Progressive Dinner, a longstanding Southside tradition. Our neighbors welcomed us into their beautiful private residences as the dinner progressed through the neighborhood. Abuso Catering, a favorite of Southside residents, provided the food for the event again this year, and they have the nuances down associated with delivering food to 8 different homes to make the Progressive Dinner work smoothly. 96 people attended the event this year. 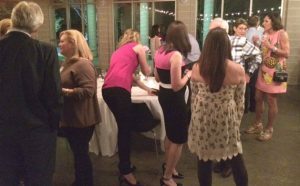 Three groups of 32 people each were directed via email to one of the three homes hosting appetizers: Jamie and Jeff Byrd on Darcus, David and Heidi Gerger on Jardin, and Megan and Chris Reed on Jardin. Appetizers included miniature tarragon chicken crepes, brie in puff pastry and cheese trays. During this opening stop of the Dinner, though, the focus is much more on a conversation (and wine) than on the canapes. Even though Southside is a relatively small and contained area, the Committee always works the logistics to attempt to keep the distances that people must travel between appetizers, dinner, and dessert to a minimum, and the Committee was lucky this year to find volunteer host homes primarily in the north half of Southside. As always, Jardin St. residents consistently step up to the plate to volunteer. The name tags for each person at the appetizer home showed where they were to go for their entrée. The 96 people attending were split into 5 different groups of approximately 20 for dinner. 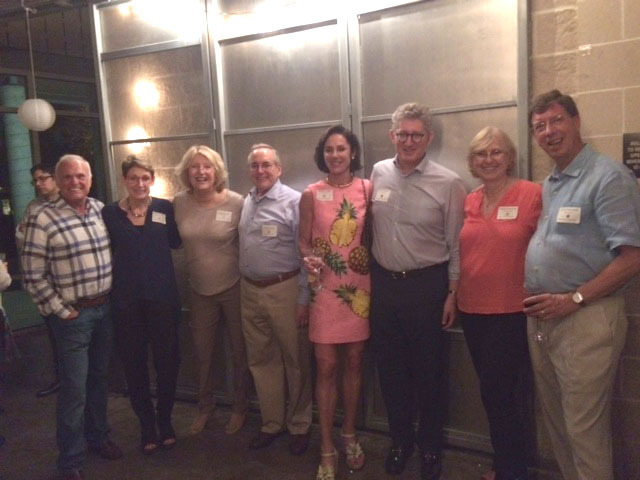 The five host homes for entrees were: Karisha and Rory Madden on Edloe, Meredith and Ben Marshall on Garnet, Carol and Cliff Pearson on Harper, Joan and Louis Pucher on Jardin and Alana Spiwak and Sam Stolbun on Auden. The dinner menu was a spring mix salad (with raspberries, pine nuts, chevre and vinaigrette dressing), chicken cacciatore (hunter style), Texas stone ground polenta (with aged parmesan) and sautéed Tuscan vegetables. The final stop of the evening was the clubhouse, where everyone met up for dessert. One of our hosts for entrees, Sam Stolbun, graciously donated the dessert for the Dinner. Sam is the President of CGI Desserts, a Sugarland bakery. Among other things, the desserts included the perennial favorites, cheesecake, carrot cake and chocolate cake. The crowd this year was a mix of people who just moved into Southside, eager to meet new neighbors, and well-seasoned veteran Southsiders, eager to see familiar faces. The unbeatable combination of old friends and new neighbors, fabulous furnishings and art, and tasty food and wine ensured that the 2017 Southside Progressive Dinner was a success and achieved its goal of strengthening bonds within the community. 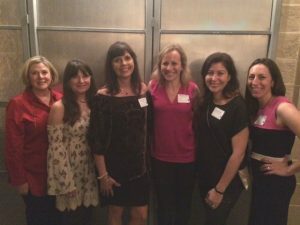 This year’s Progressive Dinner Committee was led by Vicki Piper and included Jen Fink, Melissa Hachen, Annie Kelly, Karen King and Aria Tatelman. Congratulations to the Committee for creating a memorable evening!